← 25% of the American Workforce does some work at home. Who moved the Homebuilder’s cheese? Homebuilders will sell approximately 50% less homes this year than they did in 2007, and the average prices of these homes are off by more than 50% in parts of the Country. They blame the economy, the government, even themselves, but what are they doing about it? The Homebuilding Industry has been building variations of the same 3 bedroom, 2 bath home for the classic nuclear family since the 1950’s. In 1957 this Mom, Dad and 2 kid family comprised 45% of all American Households; today it’s only 22% and shrinking. Households that are growing include single parent households, multigenerational homes for Boomerang Kids, Boomerang Seniors, and homes designed for brothers, sisters, and close friends doubling up. One in six people today live in a household with two adult generations, but try to find a home in the suburbs to accommodate this and you won’t. Perlman Architect’s new Fusion 2Gen™ home looks like any other home on the block, but it actually contains two independent living units, each with their own entries and kitchens. The 3Gen™ home provides private independent living for three families living together. Fusion homes create richer neighborhoods with happier kids and better balanced families. They are just plain sensible. Lennar homes is leading the Fusion Revolution with their private label brand “Next Gen” home now available all over AZ, Southern CA and soon NV. Meritage and Beazer homes are close behind. Fusion started this revolution that has energized the homebuilding industry. Their homes are great for homebuilders, which makes them great for the economy, and most importantly they are great for the families living in them. 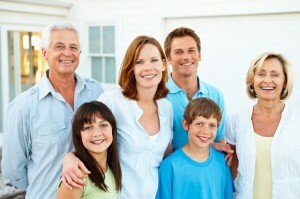 To find out more about them, visit myFusionhome.com. This entry was posted in Doubling Up and tagged Boomerang Kids, boomerang seniors, Builders, families living together, Fusion homes, Homebuilding, multigeneration, multigenerational. Bookmark the permalink.